When the results from Jazzalyn's prenatal screening came in, her family immediately knew something was wrong. Several days and tests later, they learned that Jazzalyn had Severe Combined Immunodeficiency (SCID). Within Jazzalyn's first week of life, she was admitted to Texas Children's Hospital (TCH) where she spent months in the Intensive Care Unit and, eventually, the Bone Marrow Transplant Unit (BMTU), where His Grace Foundation (HGF) entered her world. Jazzalyn's aunt, Patsy, recalls the blankets found inside their HGF welcome basket, a cozy comfort of home that made their hospital room brighter and more colorful. 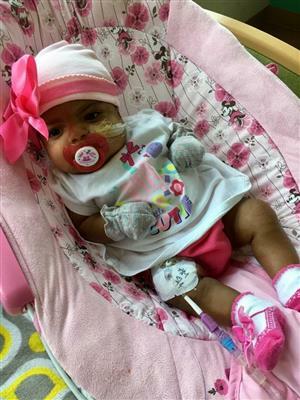 Their family was sad and disappointed to spend Jazzalyn's first Thanksgiving in the hospital, but, in their words, "HGF thought of everything. There are many times that catered meals were brought into the room, but Thanksgiving one was the one that touched my heart the most." Thanks to the incredible TCH staff and treatment she received, Jazzalyn celebrated one year of life on January 29, 2018. As her family thinks back on the way HGF came alongside them during their stay, they joyfully remember the weekly shopping service, as it allowed them to pick out specific foods and hygiene products, as well as the infant wish list through which they were able to make a larger request that would ease Jazzalyn's stay on the BMTU. They chose a stroller, which Jazzalyn loved to ride in for walks around the BMTU halls when she was feeling well enough.